While this certainly isn't the best slice of life anime of the moe variety that I've seen, it's still a very fun watch. The characters are all charming and lovable, despite a lot of their flaws and they definitely give some good insight on game development and how challenging it can be. My only issue is the pacing of this show can drag a bit in places, especially in the first season. Overall, I do recommend this one, especially if you're a slice of life or moe fan. Slow and sweet, with extra sugar. This anime is so sweet. The characters are caring and really respecting of one another. I wish more people in the real world would be this considerate towards each other. Impossible, I know, but that's what television is for, isn't it? Make people dream? Inspired me on so many levels! NEW GAME! review that nobody will care about. OH MY GOD. THIS IS SO GOOD!!! It's funny and I instantly got hooked! Can't wait to watch the second season! All I can say is, you NEED TO watch it! It's worth the time and it's just a wonderful story. 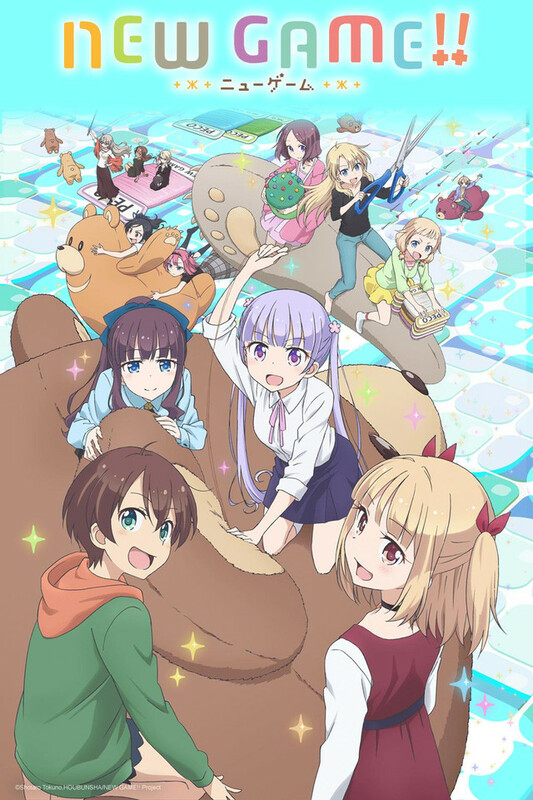 First read New Game as a manga a long while ago and recently saw this on crunchy, I am kinda oblivious but this was a really well done anime with likable characters good comedy and a dash of yurimance. It is worth trying the first few episodes even if it doesn't appeal to you because you might be surprised. The girls are back but there is some shuffling of duties and expectations like it would be in the real world. Even business politics rears it's ugly head when it comes to decide whose promo art will be used in in the initial advertising campaign. But overall this a is good fun series about work and it's ups and downs. #44. Season two should have been called "New Game! +" I mean C'mon! Aoba Suzukaze, fresh out of school, has acquired a job position as a lead character designer at her childhood favorite gaming company “Eagle Jump”. Nervous as she may be, she has nothing to fear besides the office shenanigans of her co-workers. New Game is one of my favorite slice of life comedies of all time, the art and color pallet just makes me melt at how simply gorgeous it is. The comedy is amazing, I'm a sucker for shenanigans with co-workers in anything, not to mention their workplace is a video game company, bonus brownie points since I'm a long time gaming fan. The character and charm this show has is just so bubbly and uplifts my spirits. I could go on, but at that point I would just start talking about episode by episode moments, so instead you go watch this if you haven't already! I really loved this serie from the very first episode to the very last. There was alot of fun and suprising moments in it and also some sad moments. Got good laugh and smiled alot and shed some tears. I can highly recommend watching this for everyone. Work place comedy where people do seem to actually do work. The greatest crime of this show is that there isn't a season 3 yet. I don't want to hear excuses about there not being enough source material yet in the manga. Anyways, this is a great, heartfelt workplace comedy with a solid cast of characters that all have meaning in the story. The animation is great, solidly matching the source material in style. By the end, you'll find yourself really attached to this crew of misfits, hoping to see them again soon.